ISTANBUL, Turkey (Morning Star News) – Turkish authorities have released a U.S. evangelist who was detained last week and ordered to be deported, sources said. Declaring David Byle “a danger to public order,” authorities in Turkey took him into custody on April 6 after asking him to report to the immigration office in Istanbul regarding his application for a residency permit. Byle, 46, was released on Thursday (April 14) after a judge oveturned the order ot detain him for 30 days. Byle had been told his application for a residency permit had been denied; he was immediately taken into custody and then transferred to the Fatih police station in Istanbul. Police held him for two days before transferring him on April 8 to a holding center for foreigners awaiting deportation, the sources said. Byle’s wife, Ulrike, said he was told when he arrived at the immigration center that there was no deportation order against him. Normally the center would have no authority to imprison someone without a deportation order, but because Byle was taken there under police custody, immigration officials had the authority to hold him for 48 hours. The next day, Byle’s attorney informed him that the immigration department had filed a deportation order against him upon direct recommendation from the Ministry of the Interior, which had claimed in a report to the department that Byle was a “danger to public order” and a flight risk. There was no indication of what the “danger to public order” accusation was based on, Byle’s wife said. Byle was also informed that the government had filed a “no-reentry order” forbidding him from coming back into the country once deported. It is unclear when the order was filed or the length of time the order is valid. Finally, and of particular concern to Byle and his family, authorities claimed that because of the alleged potential danger he posed to Turkey, the government had the “right to supervise” him for 30 days – meaning they could hold him for a month without filing charges against him. Ulrike Byle said the thought of her husband being a flight risk or a danger to the country was laughably absurd. “I feel it’s funny,” she said. Byle is known for being mild-mannered, polite and calm. He has no criminal record, and Urlike Byle said she thought he had been detained because of his evangelistic activities. The arrest took place days before Byle was set to teach a class to a group of Turks on how to tell people about the gospel, though there was no public indication of a link between the arrest and the scheduled training. Byle is part of a small number of Christians in Turkey, and an even smaller number of expatriate Christians, who openly evangelize in the country. A ministry leader at U.S.-based International Christian Response (ICR), which provides aid to persecuted Christians, said Byle lives in a sacrificial way totally immersed in his mission. The organization Byle co-founded, the Holy Book Information Association, also known as the Bible Correspondence Course in Turkey (BCC-Turkey), normally focuses on educating the Turkish public about the Bible. This alone is controversial in Turkey, and Byle also conducts “street evangelism” outreaches. These outreaches have garnered the most attention from the government, which at times has identified Christian missionary activity as a security threat. 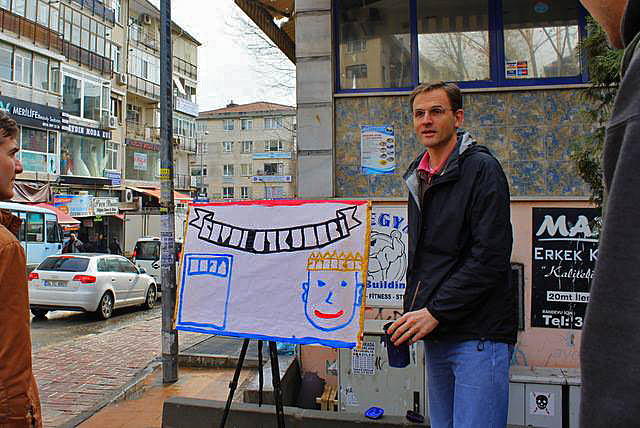 Police first arrested Byle for street evangelism on April 25, 2007, in the Beyoglu District of Istanbul after officers said people complained about aggressive evangelism, especially on the part of a South Korean missionary worker. Byle said police charged him with “forceful missionary activity” and disturbing the peace. Authorities kept Byle in custody for two nights. Before releasing him, they made him sign a document stating that if he wanted to continue doing public outreach, he would need to have some sort of work permit or else be deported. The demand for a work permit was perplexing, since it appeared they were requiring him to obtain one from a Turkish sponsor for an activity they told him was illegal. A prosecutor dropped the first charge on May 8, 2007, because Byle’s literature did not insult other religions and because “missionary activity” is not a crime in Turkey. On Nov. 1, 2007, a judge threw out the final charge of disturbing the peace. After the final charge was dismissed, Byle wrote a letter to the Ministry of the Interior inquiring about the document he was forced to sign. He never received an answer. Police detained Byle a second time on Nov. 18, 2009 in the Pendik District of Istanbul, along with several members of a BCC street evangelism team. While in custody, Byle was made to give a written statement about what he was doing, and then he was released. In February 2010, police told Byle his upcoming application for residency would require further investigation, and less than a month later, on March 9 at 10:30 p.m., two plainclothes police officers arrived unannounced at his door and took him into custody for deportation. Officials in the Pendik District had filed a report of charges into a confidential record system but never through the court system for prosecution. Byle retained a lawyer, who was able to temporarily block the deportation order until an Ankara court granted a decision in April 2011. It found that because he had never been found guilty of committing any crime, and because he was conducting activities in accordance with the constitution of BCC, which the government approved, the Ministry of the Interior had tried to deport Byle in violation of the law. It ordered the deportation order be cancelled. Since his first arrest, Byle has been plagued by problems with Turkish authorities, including a five-year court battle for residency that ended, seemingly, in January 2015, when a court ruled that the government had not shown significant evidence that he was “a threat to national security and public morals” or that he had ever even committed a crime. If a court grants a temporary injunction against the deportation order, Byle will be thrown into a legal battle on three fronts, his attorney said. The first battle will be against the deportation. The second battle, over the detention order, has been won for now. The last will be against the reentry ban. If the court refuses to grant the injunction, and if the reentry ban remains, Byle will be forced to leave Turkey, and his wife and five children will eventually be forced to follow. According to Ulrike Byle, her husband was not mistreated in jail. After guards at the detention center became aware of potential safety issues that Byle might face from suspected Islamic State (IS) members held in the detention center, he was moved to another floor. 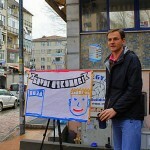 Byle has been jailed or detained several other times by Turkish authorities and he dealt with this term of incarceration by preaching to other detainees and finding ways to get donations from others of much needed clothing for those held with him. He also planned to start teaching Turkish and English to other detainees.